BehindMLM reviewed AWS Mining two days ago and found it to be a typical MLM crypto cloud-mining Ponzi scheme. The company pretends to pay out affiliates via cloud mining profits, however no hard evidence of this taking place exists. Furthermore AWS Mining is not registered with securities regulators in markets it actively recruits new investors from, meaning any claims made by the company cannot be independently verified. The World Digital Mining Summit bill itself as ‘2018’s most exciting industry gathering in the digital mining world‘. The event kicked off on September 21st in Tbilisi, Georgia (the country, not the US state). AWS MINING COO, Daniel Beduschi, is currently attending the world conference of digital mining in Tbilisi, Georgia. 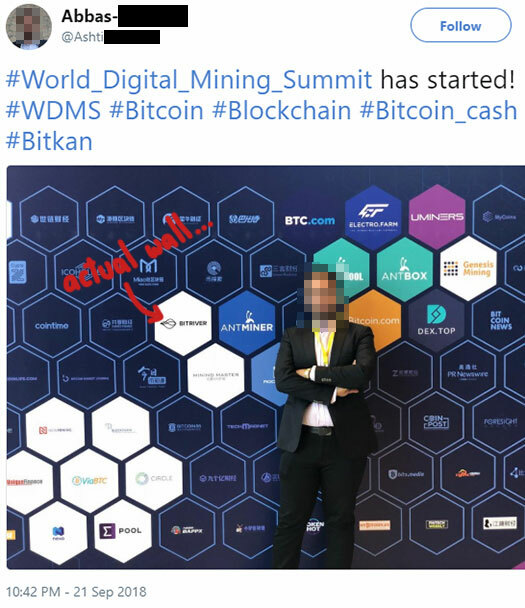 If you click on the screen-cap above you can see it in full-size – at which point it becomes painfully obvious Beduschi has been cropped and photoshopped in front of World Digital Mining Summit’s photo wall. I suppose when you’re lying about paying affiliates with crypto mining profits and running a pyramid scheme, might as well lie about who you’re mingling with for fake credibility too. 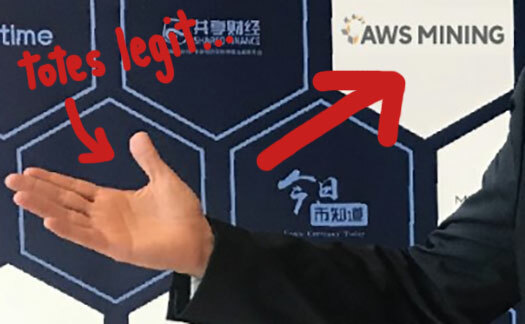 Update 25th September 2018 – As of September 25th AWS Mining has removed their World Digital Mining Summit photoshop fail from their Facebook page. The sad thing here is Beduschi does appear to have actually attended the event, or at least he got to stand outside with a camera. Why on Earth would you botch that with such a poor Photoshop effort? DANIEL BEDUSCHEAD: Is this guy an idiot or what, can’t even photoshop to make it look legitimate. Scumbags like this that spend all there time lying and cheating victims around the world usually have a third grade education and learn there conning skills on the street. Give the crook a pair of knee pads and put him in jail…. Verifiquei o facebook mencionado não encontrei esta imagem alem de que as roupas que ele estava lá não é essa, e encontrei a foto dele lá com esse mesmo texto mas não era essa montagem ai não, porque ao invez de uma foto do facebook, não colocou o link. I don’t typically allow non-English comments but I’ll let this one slide. Thanks for the heads up on the photo removal. I believe the change in clothes is because the event spanned more than one day. Note that the new photo is just Daniel Beduschi standing in front of the booth of a blockchain explorer website owned by the mining company BitMain. It has nothing to do with AWS Mining or Beduschi attending the World Digital Mining Summit as a pedestrian.